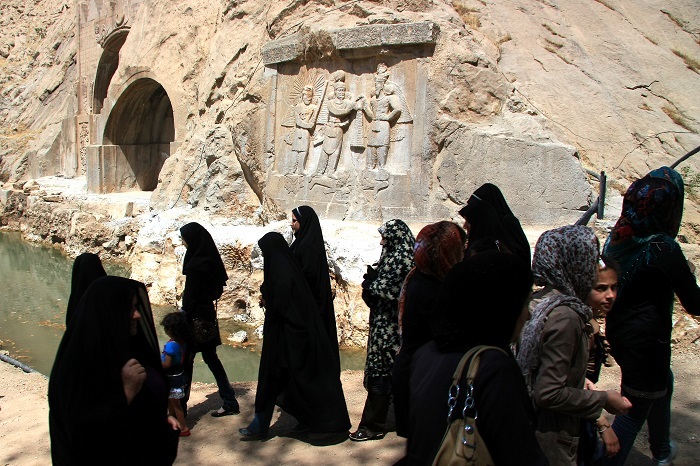 Taq Bostan, also known as Taq va san, is an archaeological site with a series of interesting large rock reliefs that are located in the vicinity of the city of Kermanshah, in the heart of the Zagros Mountains that are running through the Islamic Republic of Iran. 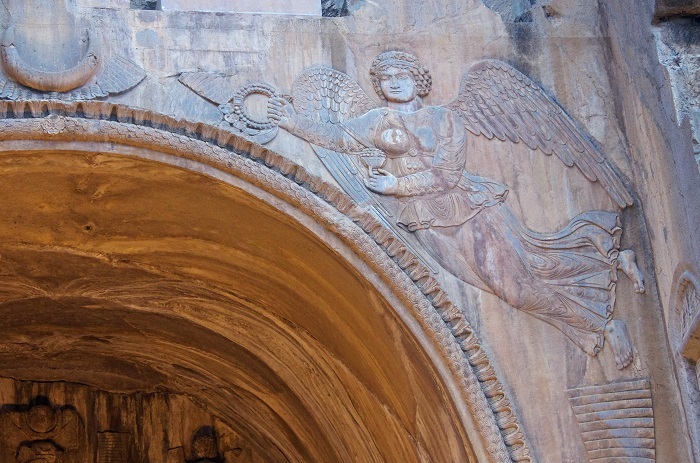 When the name will be translated into English it literally means Arch made by stone, and it is considered that they have been carved during the Sassanid Empire of Iran, which ruled western Asia from 226 until 650. These are definitely one of the finest and also best preserved examples of Persian sculpture throughout the history, as they have endured more than 1,700 years of harsh wind, rain and sun. Still, this site is consisted of plenty of other series of properties from prehistoric to historical periods such as Morad-Hassel Tepe, an ancient village, a Parthian graveyard, however, the two porticoes of the Sassanids are one of the greatest treasures of the site. 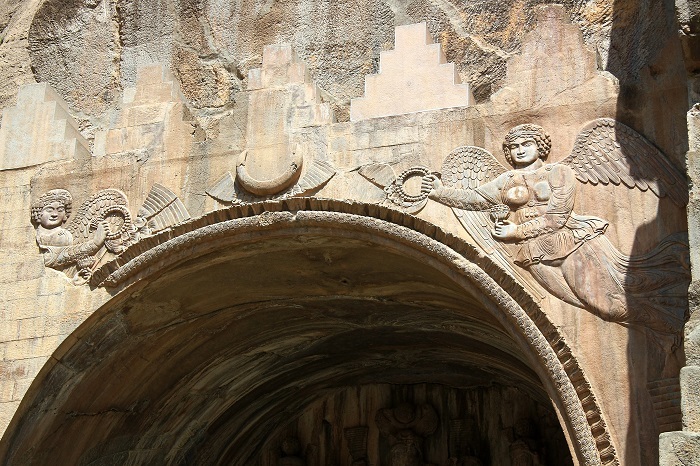 Through the reliefs, Taq Bostan shows the highlights of power, religious tendencies, glory, honor, the vastness of the court, games and fighting spirit, festivities and joy of the Sassanid period, and due to its location on the Silk Road, it has gained a great deal of attention. 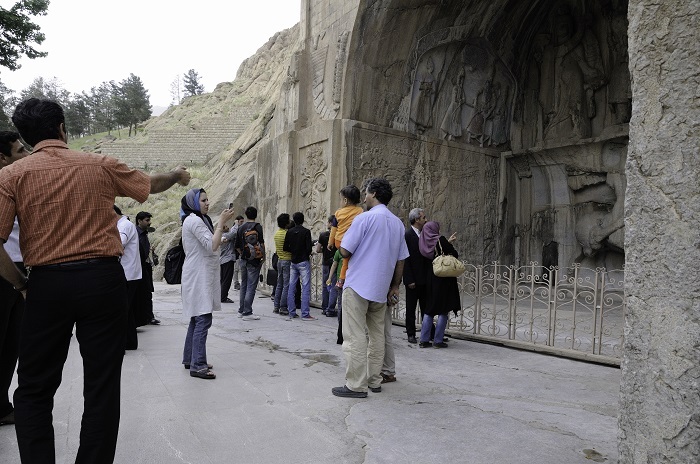 Nevertheless, the site contains the two arches, one big and one small that are the most known ones of Taq Bostan, in addition to the several other reliefs. 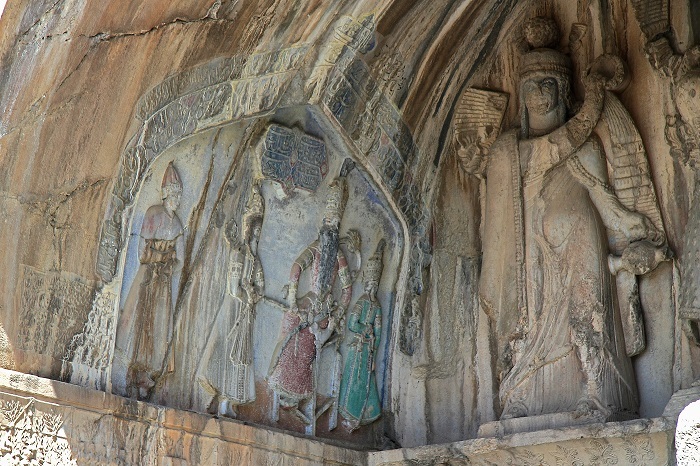 The illustration of those reliefs and arches are the investiture ceremonies of Ardashir II, Shapur II, Shapur III and Khosrau II, as well as the hunting scenes of Khosrau II. 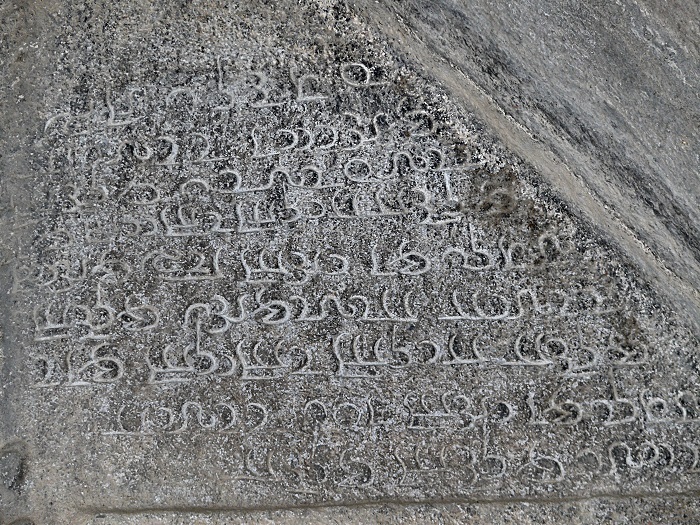 The first and oldest relief is 4 meters (13 feet) in width and height, and it includes figures of four people with swords, helmets and lotus. 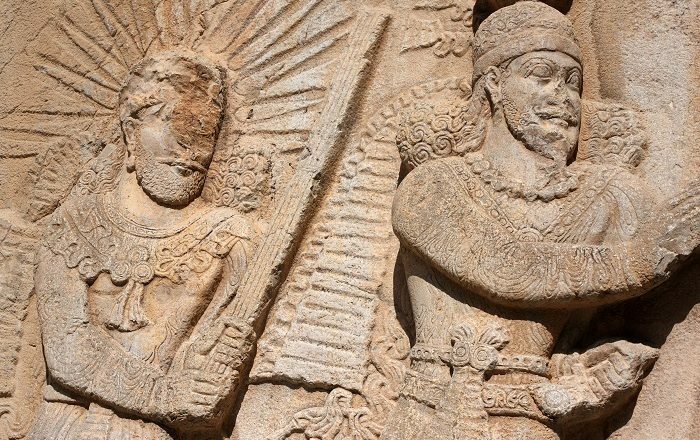 As researchers debated for quite long time about the identity of these figures, most of them have agreed that one of them is Artabanus IV, the last Parthian king whose rule terminated in 226. Still, today it is believed that the figures are Ardeshir I and his son Shapur I, stepping over the dead body of Artabanus IV, delighted and intoxicated with victory over their enemy. 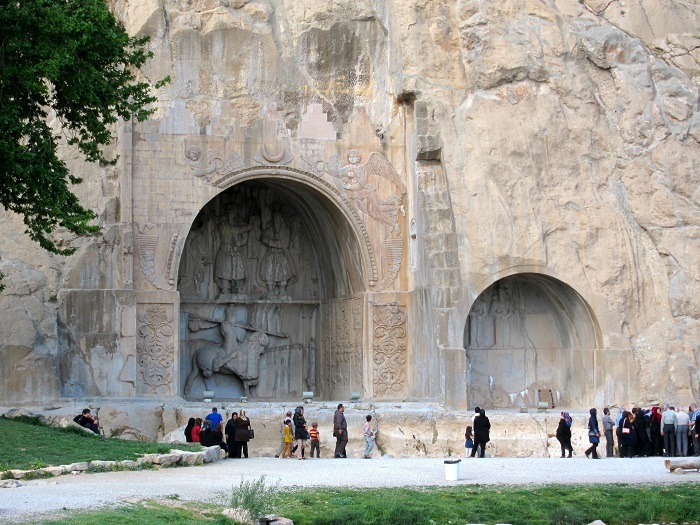 The smaller arch has two inscriptions which are written in Pahlavi script and carvings of Shapur II, or Shapur the Great, and his son Shapur III facing each other. 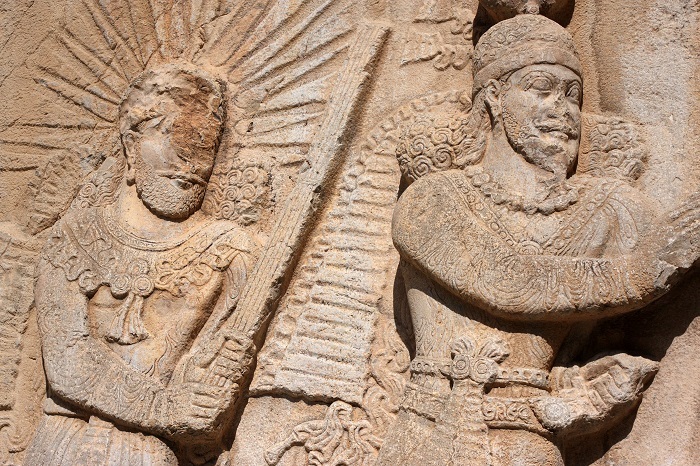 Shapur II is on the right and Shapur III is on the left with each figure’s hands placed on a long straight sword pointing downwards, and both figures wear loose trousers, necklaces, curled hair, and a pointed beard ending in a ring. 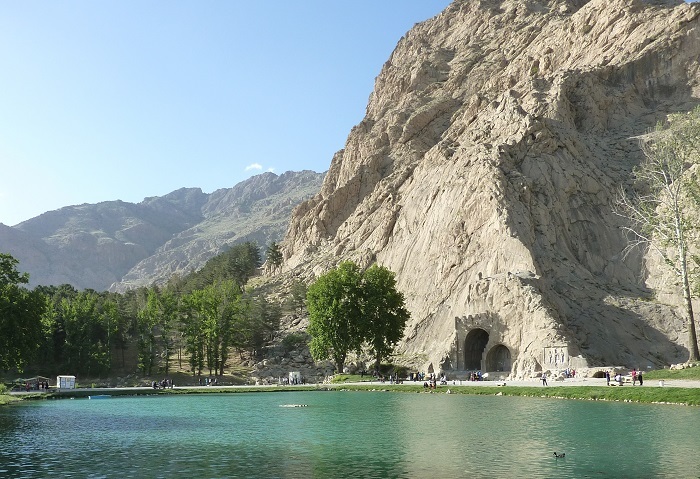 In addition, there is a small cave for which is believed to be built during the reign of Shapur III, but some are assessing that the completion has been in 385. One of the most impressive reliefs is the gigantic equestrian figure of the Sassanid King Khosrow II mounted on his favorite horse, Shabdiz, where both of them are arrayed in full battle armor. 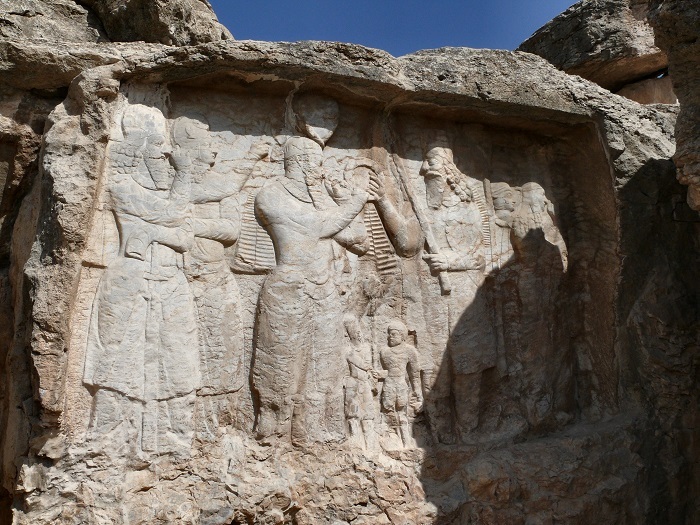 As there are plenty of other explanations for the other reliefs, this magnificent place unfortunately has attracted vandals who did some damage to Taq Bostan, which are still visible in some parts. Even the planet with its tectonic movements did some damage in the reliefs, where cracks can be seen, and with water seeping through the stones, they are becoming wider. With hope that there will be some preservation done in the near future for these glorious historic reliefs, there should be also more people who should learn more about the interesting history this area once had.